Ann I Am! 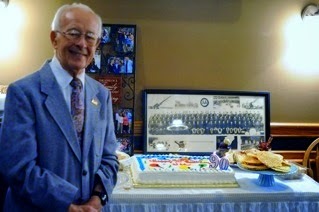 : My Dad's 90th Birthday! This past weekend we celebrated my father's 90th birthday. 90--wow, can you imagine? He is an amazing man. Born of immigrant parents, he lived through the Great Depression in the hills of West Virginia. He went on to fight in WWII and fought in the Battle of the Bulge. Following that, he attended and graduated college--a first for his family. He went on to be a successful businessman. He married and had six children, although his second son died just before the age of 4 following open heart surgery. He has battled 3 types of cancer, developed diabetes and has had heart problems. And, most recently, he lost my mother, his beloved wife of 58 years. And yet, he still made it to his 90th birthday. Happy Birthday, Dad!